GableGotwals has been recognized as a Leading Firm in the areas of Energy and Natural Resources (Band 2), General Commercial Litigation (Band 2) and Corporate/Commercial (Band 3). The qualities on which Chambers USA rankings are assessed include technical legal ability, professional conduct, client service, commercial astuteness, diligence, commitment, and other qualities most valued by the client. Interviews are conducted with peers outside of the firm and clients in order to determine inclusion and rankings. 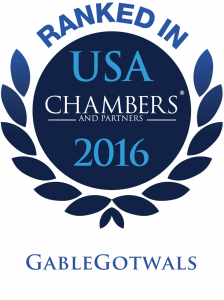 Fourteen GableGotwals attorneys have also been named as ‘Leaders in their Field’ in the 2016 Chambers USA rankings. Areas of law ranked include Corporate Commercial: Health Care, Energy & Natural Resources, Environment, Litigation, Native American Law and Real Estate. What the team is known for Over 60 years’ experience in the handling of oil and gas-related issues, not only in Oklahoma, but also in such states as Texas and Kansas, providing both litigation services and specialist support on transactions. Also offers niche expertise concerning title examinations, royalty disputes and compliance with environmental regulations, particularly with regard to fracking operations.compliance. Work highlights: Represented Cypress Energy Partners in the $11.2 million acquisition of a controlling interest in the hydrostatic testing business Brown Integrity. The transaction included provisions giving Cypress the right to acquire the remaining 49% interest in Brown at a future date. Steven Adams enjoys an excellent reputation in this space, attracting particular praise for the excellence of his litigation skills. He acts extensively in the oil and gas sphere on royalty and antitrust disputes and on injury and damage claims arising from energy production operations. Dale Cottingham is a former Oklahoma District Court judge with extensive litigation experience in the energy sector, particularly where regulatory and environmental matters are concerned. He is identified by sources as a “fine lawyer” who is “particularly active in the water pollution area” and similarly prominent on other pollution-related mandates and in the representation of companies under investigation by the Oklahoma Corporation Commission. Terry Ragsdale is consistently identified by sources as an “excellent lawyer” and a “very, very capable” handler of energy issues, drawing on nearly 25 years’ legal practice and on previous experience as a petroleum engineer. He acts on transactional and contentious matters, including contractual and royalty disputes in the oil and gas sector. Rob Robertson is a well-regarded litigation attorney of long standing whose areas of specialization include the representation of energy companies in such matters as purchase and sale agreement disputes, royalty class actions and utility ratemaking cases. What the team is known for Full-service dispute resolution offering, including the handling of appellate cases to US Supreme Court level, arbitration and mediation. Maintains key strengths in oil and gas regulatory and class action, construction, financial services and product liability issues. Veteran litigator James Sturdivant has practiced at GableGotwals since 1964 and remains a respected source of advice on antitrust, contractual, financing and other commercial disputes. His experience includes appearances in over 100 trials and involvement in many other cases settled out of court. David Bryant is one of the team’s most respected litigators, particularly well regarded for his consistent dependability. He handles high-stakes disputes in both Oklahoma and Texas and is particularly familiar with antitrust, banking, business tort and alleged conspiracy issues and the representation of fellow attorneys accused of malpractice. Sidney Dunagan is a litigator of over 40 years’ standing with a broad range that includes oil and gas, environmental and professional liability disputes. He is especially active on product liability cases, particularly those deriving from the aviation and construction sectors. Dean Luthey is a “very good litigator,” particularly well known for his work in the Indian law field, but also highly regarded for his in-depth knowledge of the closely related gaming sector. He also acts extensively on disputes in the oil and gas, healthcare and insurance spaces. What the team is known for: Full-service offering, covering M&A and securities transactions, financings and both transactional and contentious healthcare and tax-related mandates. The practice enjoys a longstanding association with some of Oklahoma’s leading oil and gas companies. Work Highlights Acted for Tulsa-based pipeline inspection and service provider Cypress Energy Partners in its $11.2 million acquisition of a controlling interest in the hydrostatic testing business Brown Integrity. Dean Luthey of GableGotwals in Tulsa is highly regarded by sources as a “very, very knowledgeable practitioner” in the complementary areas of gaming and Native American law. He is singled out for his representation, as general counsel, of the Oklahoma Indian Gaming Association. His keen litigation skills also attract positive comment. Stephen Schuller of GableGotwals is singled out by peers as an attorney they “regularly run across” in real estate matters and consider an excellent practitioner and natural referral choice. He acts principally for builders and developers on an exhaustive range of transactional and regulatory issues and is particularly well acquainted with the real estate requirements of the oil and gas industries and other energy players.